A Volkswagen research group, the Electronics Research Laboratory, is working together with the Stanford team for this year's Grand Challenge. 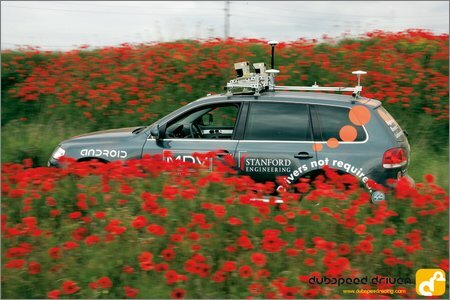 They believe that derivatives of the technology developed for the DARPA race will eventually make all of our cars safer. Are there any other car makers significantly involved in the Grand Challenge? It's interesting a car maker sponsoring a project displaying : "drivers not required"
It's Volkswagen's pun on their own advertising, the current tagline of which is "Drivers wanted." I realize this, however, very few car makers are interested in directly sponsoring a team for a product that takes out the customer from the picture. I would also go so far as to say that reducing the driver's ability to control its own car may not seem a good pitch to a certain category of driver.